The first time I had cheese blintzes, I was in shock. I knew right there and then that I had to find out more about this wonderful food and learn the tricks and intricacies in order to make my very own homemade cheese blintzes. Since I had already made my simple crepe recipe earlier this week, it seemed appropriate to make these homemade cheese blintzes as a special Sunday breakfast (coincidentally on Shavuot). 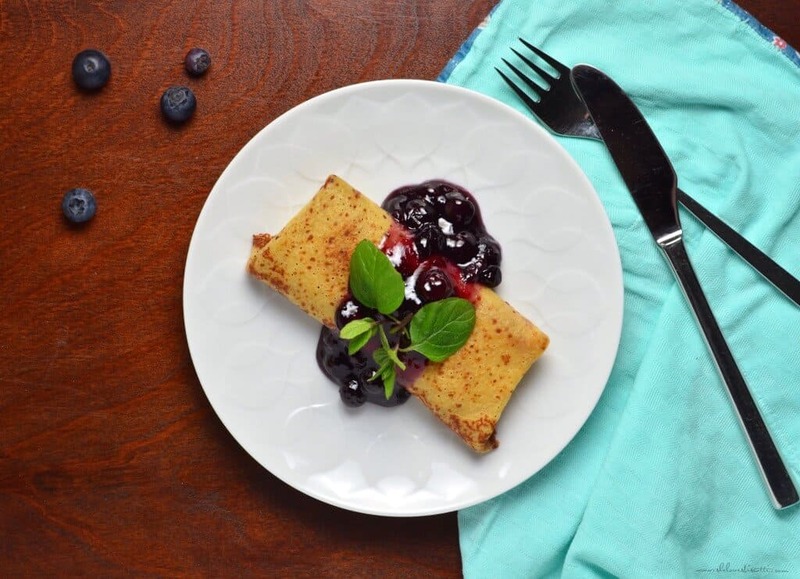 As far as I can tell, blintzes have their origin in Eastern and Central Europe, and the word “blintz” is a Yiddish term describing a crepe which holds a filling. There are plenty of varieties of cheese fillings to choose from. I have seen recipes with cottage cheese, farmer’s cheese, ricotta, mascarpone, cream cheese, sour cream, crème fraîche, and even greek yogurt. There is even a baked variation of the ever-popular blintzes by Ina Garten that I shared with you a few weeks ago. When making your blintzes, it’s important that the cheese filling is completely wrapped up in the crepe. This is easily achieved: place your crepe on a flat surface; place 2-3 tablespoons of cheese filling in the lower third of the crepe; fold bottom third over the filling; then one at a time, fold the two sides toward the middle; then start rolling to form your blintz. Easy, right? 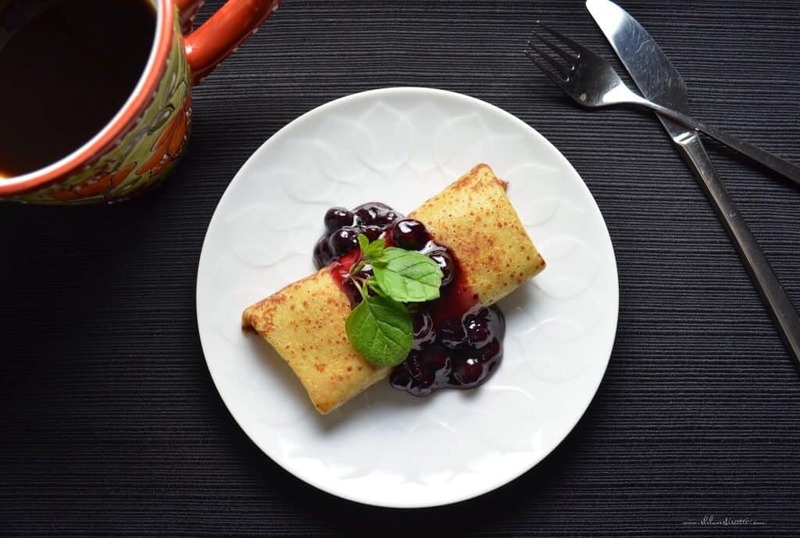 As a side note: when I am making crepes with the intention of serving these wonderful blintzes the same day, I will cook the crepes only on one side. I later spoon the filling on the cooked side, wrap up my little package and brown the “uncooked” side in a non-stick pan. In this manner, it saves a little time. 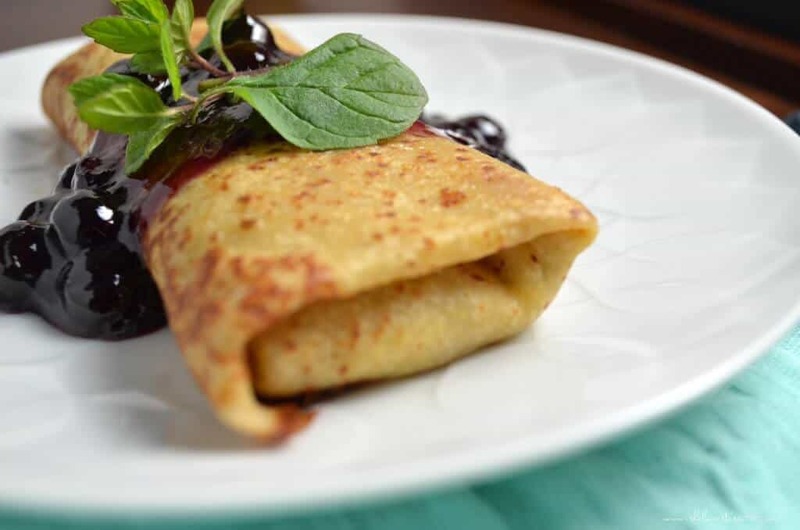 Once you have made your blintzes, they can be refrigerated for up to 1 day, or they can be frozen. The next step is to heat the blintzes. Place them seam down in an oven set at 350℉and bake, uncovered, until your homemade cheese blintzes are nice and hot (usually about 20 minutes). Alternatively, you can heat them on a stove top in a non-stick pan (make sure the filling is HOT…you want to cook the egg yolk that’s in there). 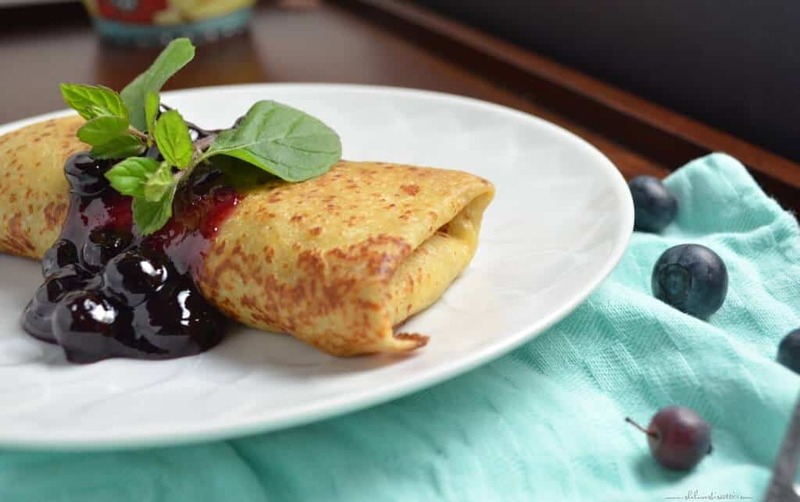 What I love about blintzes is that you can prepare them in the evening – then in the morning, just pop them in the oven while you get your toppings ready. Now comes the fun part! 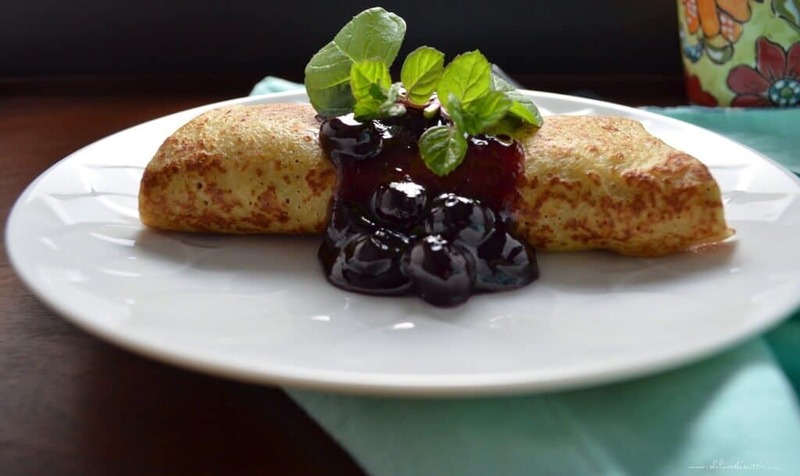 You can top your blintzes with any combination of fruit (strawberries, bananas, cherries, or my personal favourite blueberry sauce, picture above), with jam, applesauce, yogurt, sour cream, cinnamon and sugar, a dusting of icing sugar or enjoy them plain. Since I did not have a Jewish grandmother, I’ve tried a few fillings in the past and the one I am happiest with at the present moment is the one from chabad.org (cheese filling version I). As per usual, I’ve made a few changes to the recipe: I decreased the amount of honey (I think the blueberry sauce gives more than enough sweetness), and I added lemon zest. Remember, the cheese you use in your cheese filling is up to you. If using ricotta, remember to drain – otherwise your mixture will be too wet. Low-fat versions of the cheese of your choosing work very well, too. Would you like to bring your crepes to the next level? Try making these Homemade Cheese Blintzes and get ready to be amazed! ★★★★★ If you have made this Cheese Blintze recipe, I would love to hear about it in the comments below and be sure to rate the recipe! Would you like to bring your crepes to the next level? Try making these Homemade Cheese Blintzes and get ready to be amazed! Place all ingredients for the filling in a blender. Place your crepe on a flat surface. Place 2-3 tablespoons of cheese filling in the lower third of the crepe. Fold bottom third over the filling. One at a time, fold the two sides toward the middle; then start rolling to form your blintz. Place in pre-heated oven set at 350℉and bake, uncovered for about 20 minutes. Alternatively, you can heat them on a stove top in a non-stick pan (make sure the filling is HOT...you want to cook the egg yolk that's in there). While the blintzes are baking, we can make the blueberry sauce. Just before removing from stove top, stir in the reserved blueberries, lemon zest and juice. Keep warm. 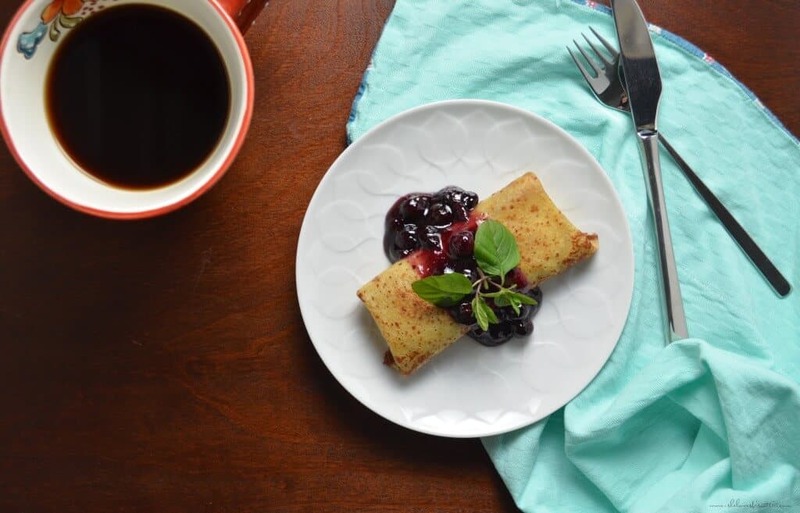 Ladle blueberry sauce over Homemade Cheese Blintzes and serve immediately. Here is the link for the Simple Crepe Recipe. If you do not have pressed cottage cheese, you can use well-drained ricotta. What I love about these homemade cheese blintzes is that you can prepare them in the evening - then in the morning, just pop them in the oven while you get your toppings ready. Total yield for the blueberry sauce is 4 cups. the recipe sounds good, but give me just a little sugar and some raisins and cinnamon in the mis. Then a big glob of sour cream. Incidentally, I sauté mine in butter. It gives a beautiful golden brown color. I’m kinda embarrassed to say I had never heard of blintzes before now! As a crepe lover, I will surely try these out! Thanks Maria!